The RV(E)-120 ... rooftop ventilation. Greenheck has boosted its offerings to the HVAC sector with a range of fans and a rooftop ventilation line, all designed to enhance performance and meet specific requirements. 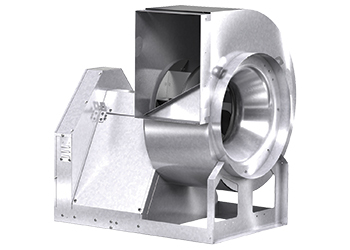 Greenheck, a global leader in manufacturing and distributing air movement and control equipment, has launched its new Utility Set Fan (USF) Series, which is said to offer multiple levels of construction to meet a wide range of commercial and industrial applications. The series includes the USF-200, USF-300 and USF-400 fans that meet the different market requirements. Elaborating on these products, a spokesman for the US-based company says: “Constructed from galvanised steel with a bolted frame, USF-200 utilises a backward inclined centrifugal wheel and is designed for Class One airflow and pressure applications where clean air is being exhausted. It provides a capacities range from 50 to 13,700 cu ft per minute (cfm) and up to 5.0 inch wg (inches of water gauge). “USF-300 has an increased performance range with capacities up to 54,000 cfm and 5.0 inches wg and is used in applications where a coating on the housing and in the airstream is required. Meanwhile, Greenheck has introduced the new eCAPS Fan Application Suite, an online fan selection programme designed specifically for HVAC (heating, ventilation, and air-conditioning) engineers. “eCAPS allows engineers to easily compare multiple fan models simultaneously based on fan performance, sound levels, operating costs or first costs,” says the spokesman. The programme automatically cautions users when selections are close to maximum RPM (revolutions per minute) or when the selection is close to being unstable, thus ensuring accurate fan selections. USF-200 from the USF series ... Class One airflow. Product selections can be easily shared with others and custom equipment schedules can be created. A toolbox feature in eCAPS includes a systems effect simulator that shows how the selected fan will perform under various inlet and outlet conditions, the spokesman explains. The toolbox also provides a convenient source for the latest fan application technology such as EC (electronically commutated) motors, airflow monitoring, and Greenheck’s Fan Fundamentals online courses. Greenheck’s eCAPS runs on iPads, tablets and computers and can be accessed at ecaps.greenheck.com. Among other innovations in its product portfolio, Greenheck has expanded its packaged rooftop ventilation line with the addition of Model RV(E)-120. 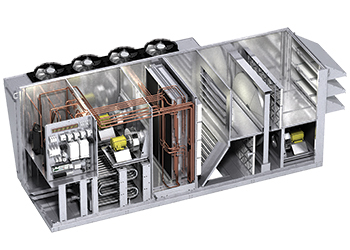 This pre-engineered system features increased performance capabilities for larger dedicated outdoor air systems, multi-zone VAV (variable air volume) systems, and single-zone VAV systems. Model RV(E)-120 has a two-inch R13 foam panel construction and thermally broken design. Low-sound condenser fans are an average of five to 10 dB less than standard condensing fans for quieter operation, while dual supply and exhaust fans deliver improved performance as well as reduced unit electrical loads, says the spokesman. “Four independent cooling circuits allow for excellent cooling turndown and control. On indirect gas-fired furnaces, 10:1 modulating turndown is available for increased operating performance,” he continues. “With performance capacities up to 12,000 cfm, up to 45 tons of cooling and up to 800 Mbh heating, Model RV(E)-120 meets the demands of today’s heating, cooling, dehumidification, and ventilation requirements,” the spokesman concludes.